Symptom: Would not boot up. Machine appeared dead. Revenge From Mars is one of two pinball machines using the Pinball 2000 platform, which combines pinball and video. A video image is projected down onto a special playfield glass which merges video action with pinball. The pinball machine is controlled by a customized personal computer platform. The machine uses a CRT for the video projection. Both the PC and CRT have many failure points. 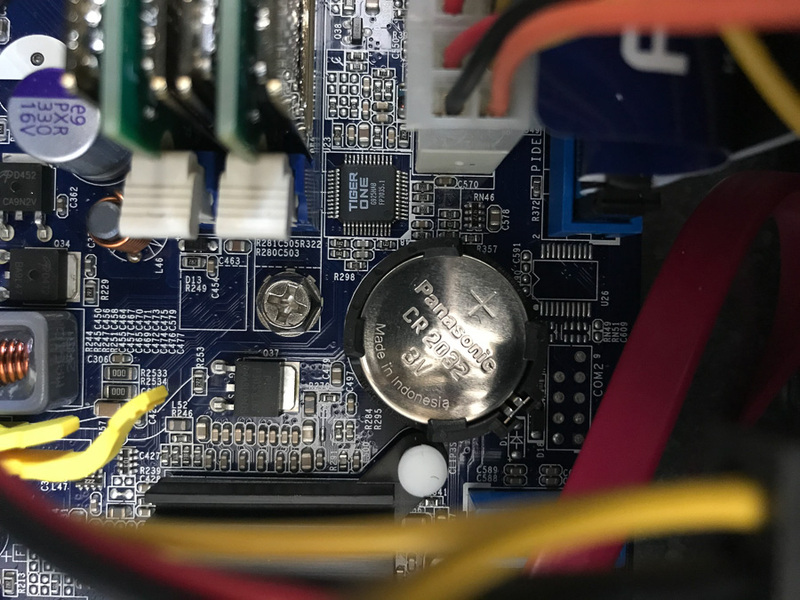 Parts to repair the PC are scarce, as are people who can repair CRT monitors. This particular pinball machine had been upgraded to an LCD monitor and a modern PC. The PC was running software provided by Nucore, which allows the custom Pinball 2000 system to be emulated on commonly available PC hardware. 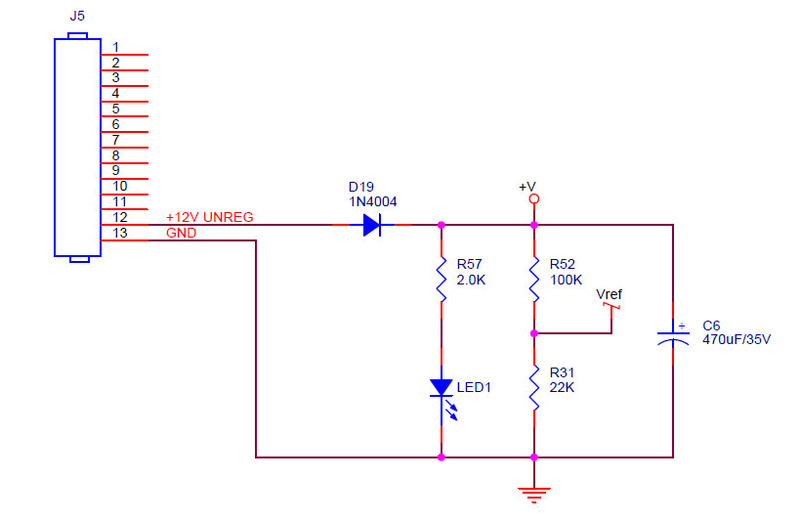 After checking some voltages, it appeared power was going into the PC, but nothing was happening beyond that point. 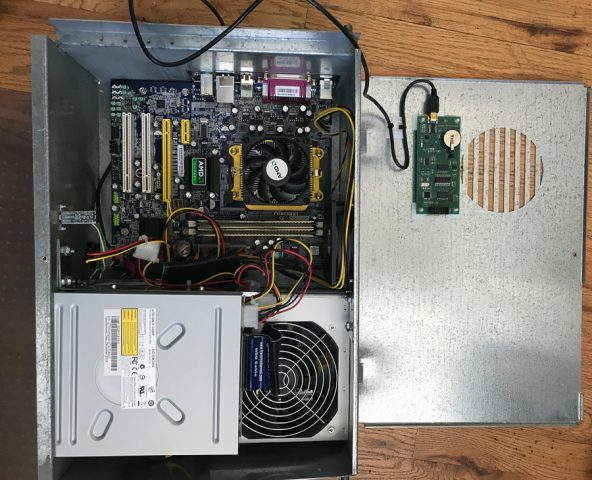 So I ordered a new power supply and installed it, and it was still dead. I was expecting to have to replace the PC motherboard. As a last ditch effort, I decided to check the CMOS memory battery. The battery was dead, but I had never encountered a PC that wouldn’t power up due to a dead battery. I replaced the battery and surprisingly it powered up. Most PCs will still power-up with a dead battery, but you get a message from the BIOS saying there is a problem with the CMOS (or NVRAM), and it often hangs before booting the operating system. The motherboard is a Foxconn A6VMX series. The above settings will allow the system to start as soon as power is applied, and will skip checking if the keyboard, mouse and floppy are present. 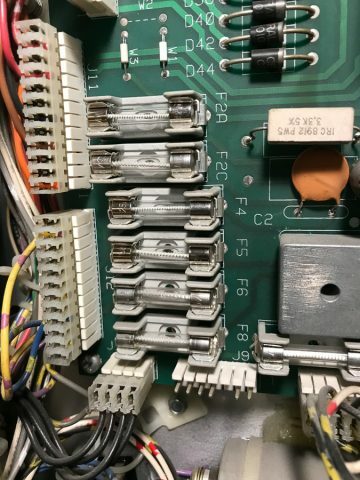 Once the system was booting up, I discovered a number of switches and lights not working. I replaced a couple of switches that were broken and adjusted the ones that weren’t working. 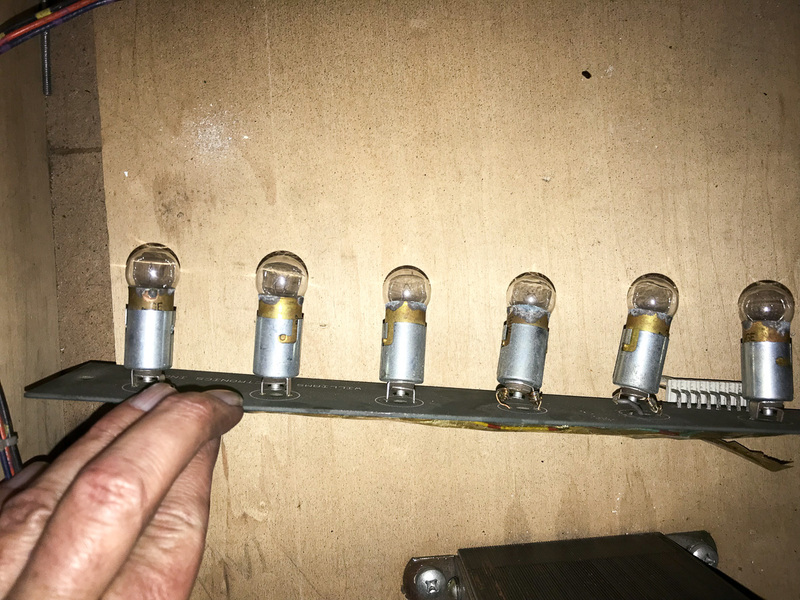 For the lights, every one of the light boards had cracked solder joints at the input connector, which often resulted in the entire board not working. 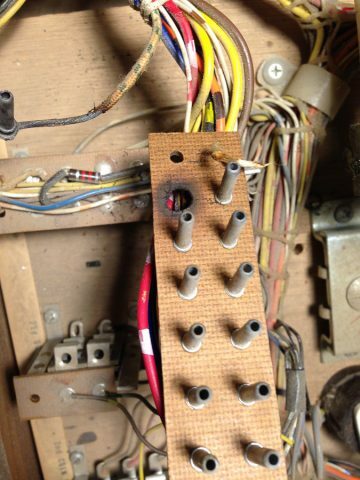 This is a common problem on most late model Williams machines using circuit board mounted 555 bulbs. 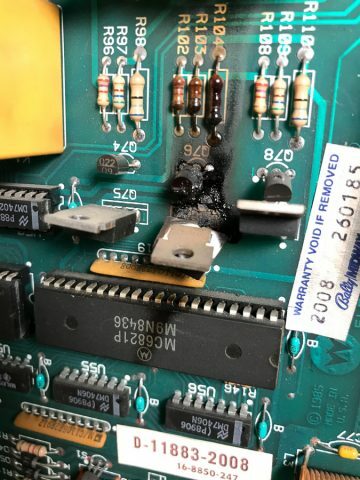 There has been some legal drama surrounding Pinball 2000 emulation systems. Nucore developed the system, but were found violating the GPL open source license. At around the same time someone removed the copy protection and distributed the Nucore software for free as Pinbox. Nucore and Pinbox are the same thing. Nucore is back with an updated version, but currently without the licensing to make copies of the original pinball 2000 ROMS, which are required to run the emulation. Symptoms: 50 or 5000 points repeatedly scoring. I’ve worked on several Space Mission pinball machines over the past 3-4 years. One problem they’ve had in common is the sometimes the 50 or 5000 point relays will get stuck and stay engaged. The problem would often go away when I raised the playfield, making it very difficult to diagnose. 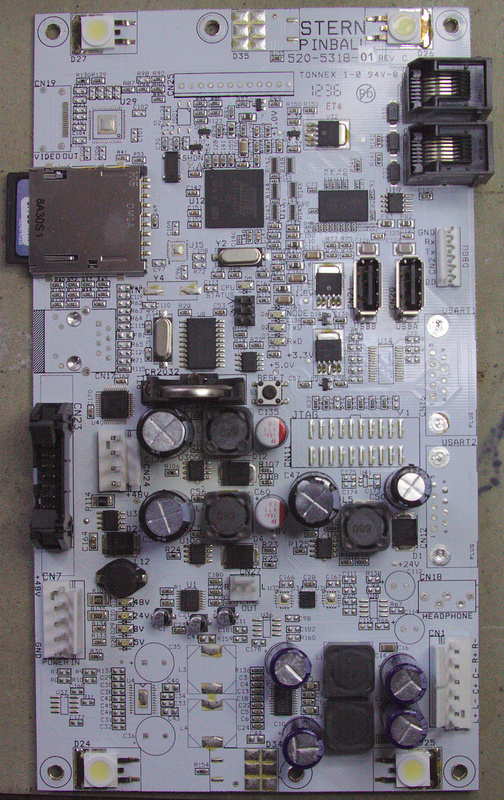 The 50 and 5000 point relays are mounted on the underside of the playfield in the upper left corner (lower left when playfield is raised and viewed from the underside). 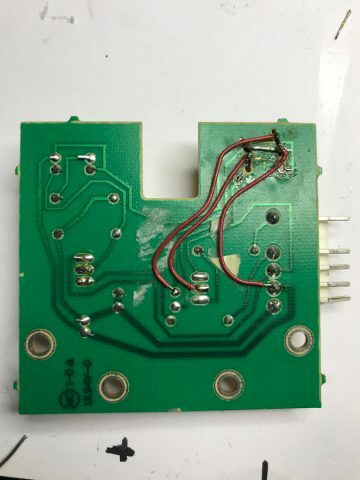 The problem is the main wiring harness which comes onto the playfield on the right side shorts against the bracket holding one of the stepper units. 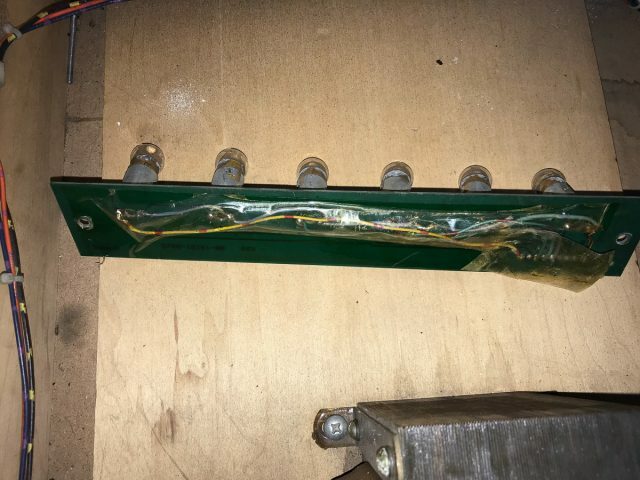 Over the years repeatedly raising and lowering the playfield causes the edge of stepper bracket to wear through the insulation on some of the wires in the main harness. 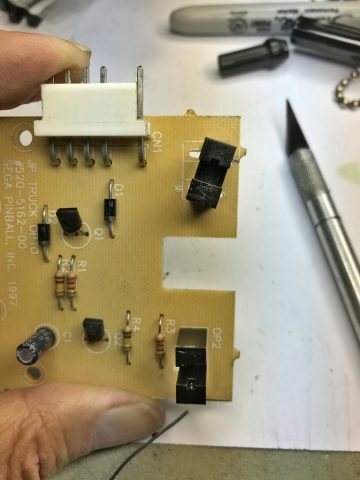 The stepper bracket has voltage on it via the main Yellow power supply wire. This creates an intermittent short between the Yellow supply wire and whatever wire(s) on the outside of the harness which happen to have their insulation compromised. 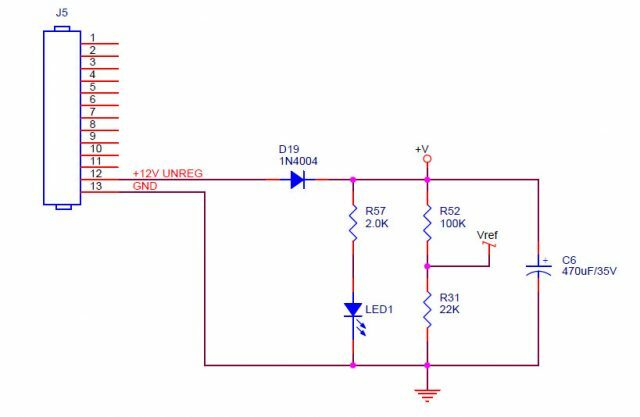 The symptoms are variable with the most common problem being the 50 and 5000 point relays staying on. But I’ve seen other symptoms including hitting the center target when the 5000 point lamp is lit and not scoring and not scoring bonus points at the end of the ball. One machine had 3 wires that were occasionally shorting against the bracket which caused constantly changing symptoms, most of which would go away when the playfield was raised. 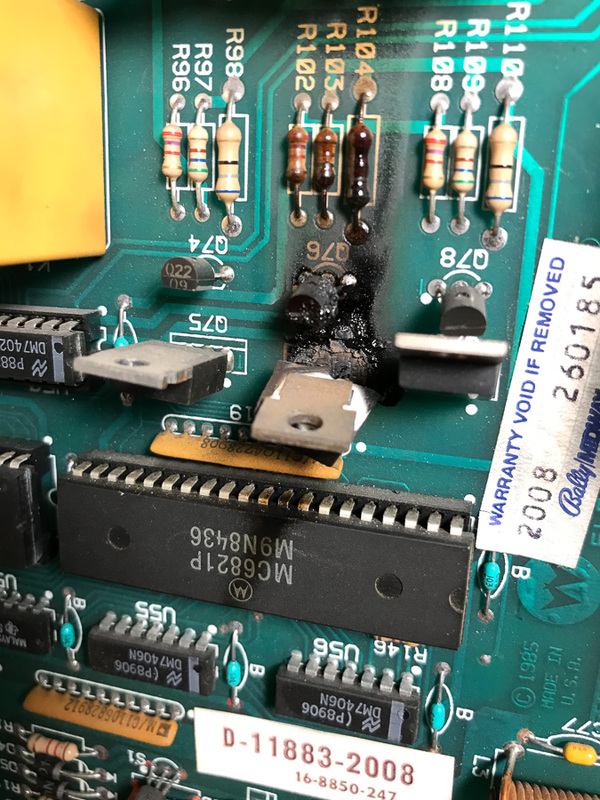 The fix is to remove the stepper unit near where the harness attaches to the playfield and then remove the screws holding the harness clamps. Wrap the harness with several layers of electrical tape near where the bracket is. Then reattach the clamps and the stepper unit. I will try to remember to take some photos next time I work on a Space Mission and update this post. Often the last thing I’m thinking about when I’m at a customer’s working on their machine is taking photos of what I’m doing. A picture is worth a 1000 words.